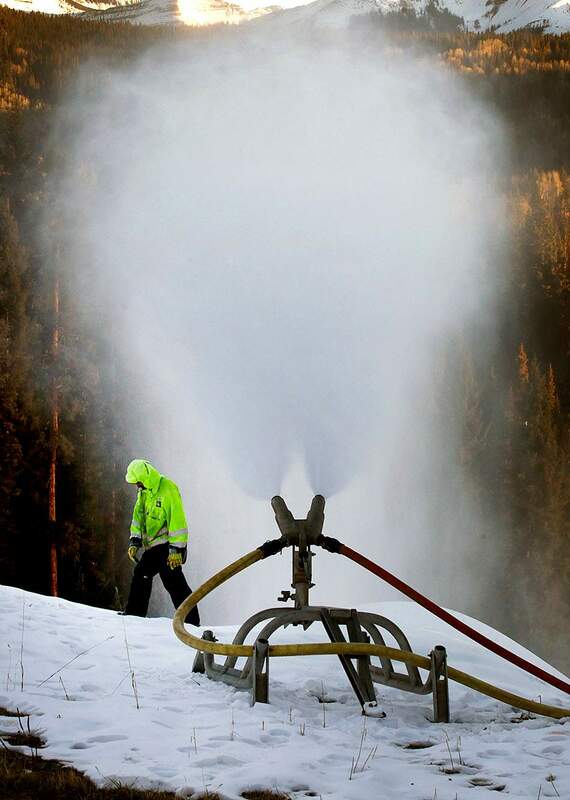 Despite a drought year for the record books, Purgatory Resort expects to have enough water for snowmaking this season. Southwest Colorado has been listed at some level of critical drought stage since spring, which has resulted in the second-lowest water year in recorded history. But Purgatory’s snowmaking capability seems to have been spared. 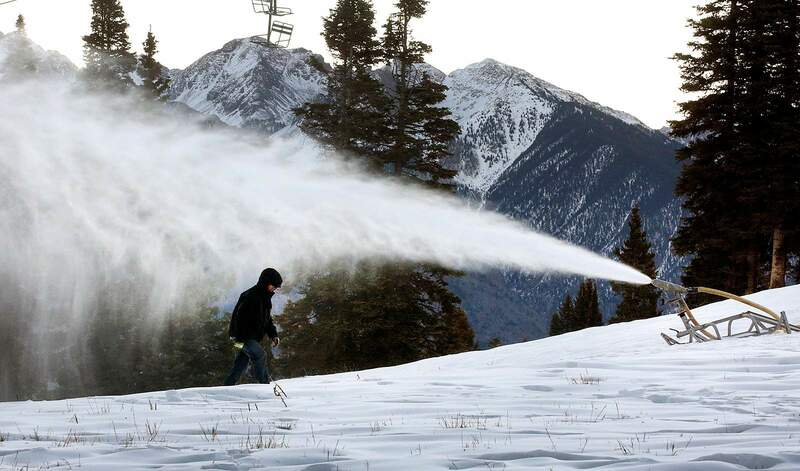 In fact, Purgatory started making snow for the first time this season Oct. 14, ahead of its scheduled Nov. 17 opening, resort spokeswoman Kim Oyler said in a previous interview. Williams said Purgatory usually starts making snow slightly later in October, but the resort was able to take advantage of cold temperatures that entered the region. 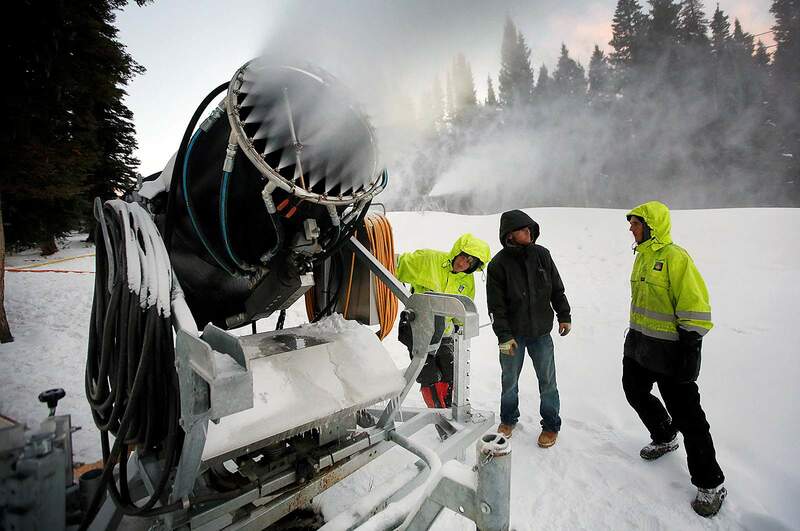 Employees at Purgatory Resort start a snow-making machine Oct. 16. The ski area says it has plenty of water this year to do snowmaking. For years, artificial snowmaking was a common practice mainly for ski resorts in the Northeast. But after the 1976-77 winter season – the third lowest water year in recorded history for Colorado – ski resorts across the West realized they needed to embrace the emerging practice. Efforts to learn when Purgatory first installed its snowmaking equipment were unsuccessful, but it is clear the resort, like nearly all others across the West, greatly expanded snowmaking operations over the years. Purgatory now has the ability to cover about 250 acres of its terrain with man-made snow, Williams said. And the resort is always looking to expand and improve its system to put more snow on the mountain. But snowmaking uses a lot of water. Purgatory uses about 40 million to 50 million gallons a year, Williams said. A Purgatory Resort snowmaker checks the quality of snow being made. Purgatory takes its water from Cascade Creek, and stores it in a reservoir across U.S. Highway 550, near the Purgatory Flats trailhead. Throughout the winter, Purgatory draws from the reservoir to feed its snowmaking machines, then refills the reservoir with water from Cascade Creek. Williams said about 80 percent of the water used to make snow returns to rivers and streams. In this sense, ski mountains act as an efficient reservoir, releasing that water in spring during runoff when water users need it most. “That water would be going downstream rather than being held above all the farms, above all the ranchers, above all the municipalities,” he said. Williams, hired two months ago, did not know the particulars of Purgatory’s water rights. Oyler said she was unable to obtain answers to questions about the ski resort’s water rights last week. She did not respond to requests for comment this week. But it appears there has been recent controversy over Purgatory’s water rights. “Unfortunately, due to recent restrictions imposed by the United States Forest Service, the resort is no longer able to count on water from the Cascade Aqueduct for its snowmaking water,” he wrote. In-stream flow requirements are water rights used to keep water in rivers for environmental purposes. Tipton’s proposed act, which would have prevented federal agencies from requiring some water rights holders to give up their rights for use on public land, ultimately failed. Jonina Vanderbilt, spokeswoman for the Forest Service, declined to talk about the issues specific to Purgatory’s water rights. 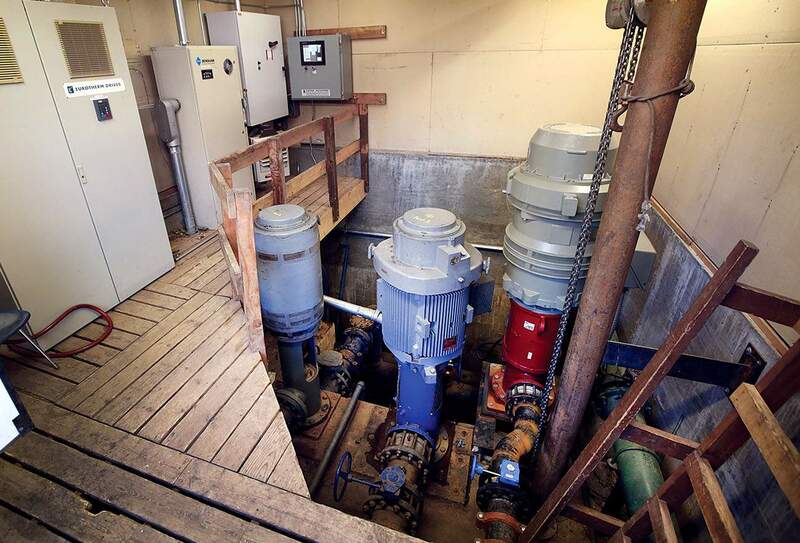 She wrote in an email to the Herald that the Forest Service continues to work with Purgatory to amend the resort’s water rights and cooperatively address the future water needs of the resort. “A key interest of the Forest Service is to ensure that a sufficient supply of water remains dedicated to ski area operations located on agency lands to support the public’s desire for the long-term ski area recreational opportunities and the economies of the local communities (sic) ski area’s (sic) serve,” she wrote. Vanderbilt said Purgatory’s “water sufficiency documentation” was completed by the Forest Service on Feb. 9. She said it would require a formal request under the Freedom of Information Act to acquire the document, which the Herald filed Thursday. A pump house midway up the slopes at Purgatory Resort helps carry water from the ponds below the resort to the snowmaking machines. Amid a record year for drought, Williams said Purgatory is being careful with its use of available water. The resort has made several upgrades to this effect, he said. Namely, the snowmaking industry more and more is embracing automated technology, which allows faster start-up and shut-down times so water isn’t wasted when conditions aren’t right. As prolonged drought plagues some areas of the West, it’s important for ski resorts to have these processes in place, Williams said. Mother Nature certainly failed ski resorts last year, with the San Juan Mountains receiving about half the amount of snow they usually do based on about 100 years of recorded data. This year is expected to bring more snow, with the National Weather Service’s Climate Prediction Center expecting an El Niño weather pattern, which tends to favor above-average snowfall for the southern San Juan Mountains. jromeo@durangoherald.comAn earlier version of this story misstated how long Mike Smedley worked at Purgatory Resort as the media relations director. Josh Hamill, slopes manager at Purgatory Resort, checks the quality of snow being made last week on the mountain. The ski resort started making snow Oct. 14, about a week or two sooner than usual thanks to cold temperatures.